complexes such as hospitals, schools and hotels also have food preparation and storage areas. 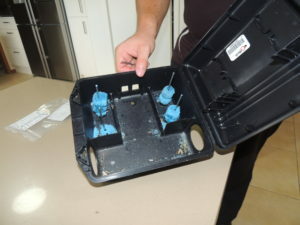 There are a variety of treatment options available to Australian homes that want to rid themselves of any rodent infestation. During winter rodent activity increases substantially as mice seek out warmer nesting areas which often ends up with them infesting homes or offices! Protecta Rodent Bait – All Baits Are Affixed With Metal Rods To Secure The Bait And Prevent Pets or Children Accessing The Bait. This is the most effective treatment method for getting rid of mice and it is our recommended treatment option to get a positive long term effect. With baiting you also don’t need to worry about seeing a gory mess as you would when using mouse traps. With our Rodent Baiting Systems you don’t need to worry about any messy residue, nasty smells or annoying mice! After ingesting the bait results are achieved anywhere from as little as 4 hours. Protecta Rodent Bait Placed Near Aviary. Aviaries and Birdseed Often Attracts Rodents. 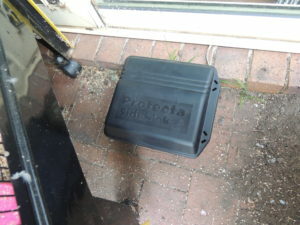 The Protecta Prevents Any Birds or Pets Getting to The Bait. 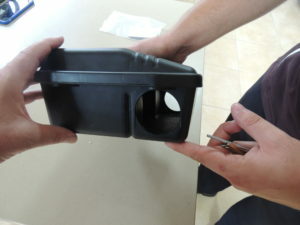 There are lots of different mice traps currently on the market but they all have similarities and generally work on the same premise (snapping down on the mouse/rat) and leaving quite a mess that would require a strong stomach to clean up. This treatment method is generally only used in agricultural settings for the treatment of large silos and due to using an airborne pesticide results are achieved very quickly over a large surface area. general improvements in hygiene standards, the availability of pest control, better medical facilities and antibiotics! Weil’s disease (also known as Leptospirosis) isn’t such ancient history – in fact, Andy Holmes, an Olympic rower, passed away after contracting this disease as recently as 2010. How did he get it? This disease can be picked up by coming into contact with water that has been contaminated by rodents. Salmonella bacteria are also spread by mice. Many people think that Salmonella comes from consuming food that is ‘off’ however, that’s not the case at all. The Salmonella bacterium is transmitted from an infected animal. It can occur either when the droppings of infected mice or other pests come into contact with food, or when food (meat, eggs or poultry for example) from an infected animal isn’t cooked properly. It can also be transmitted by human hands and by utensils – for example, when someone touches or cuts a raw product that is contaminated, and then touches food that is ready to eat with contaminated hands, or the contaminated knife. That’s just a sample of the diseases that mice and rats can carry and transmit. The symptoms of all of these illnesses are quite serious and can be fatal, particularly in those whose health may be weakened by another condition – so the control of mice and rats in the vicinity of areas inhabited or frequented by humans is absolutely vital. Household rodents can live in hidden areas such as roof-spaces, wall cavities, behind cupboards, underneath countertops, near furnaces, in the laundry, near pet areas, in basements, and in crawl spaces. If rodents are found in your house it does not automatically mean your hygiene is poor, since they might simply have been attracted to your pet feed, bird seed, or scraps you feed to wild birds or your chickens (if you keep them). 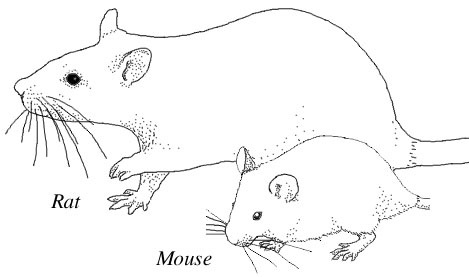 Tell-tale signs of rodents include droppings, urine stains, smear marks on walls, odours, noises at night in your attic or walls, and gnaw marks in beams or furnishings. Mice control is recommended even for commercial premises that don’t house food related operations because if buildings and properties nearby have strict pest and rodent control measures in place, an unprotected building may be the most attractive destination for the local mice!